ON THIS DATE (October 8, 2004) ... 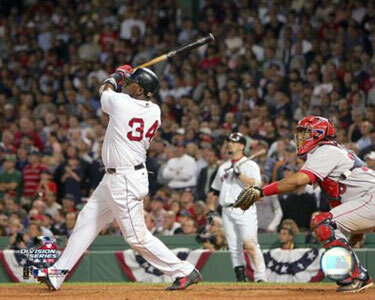 In a blast that may be remembered by the first generation of New Englanders in the 21st century as famously as a previous generation recalls Carlton Fisk’s momentous shot in Game 6 of the ‘75 World Series, Ortiz further emblazoned his image in franchise history by torquing a misplaced slider from Jarrod Washburn over the Monster with two outs in the 10th inning for a two-run shot that catapulted the Sox to an electrifying 8-6 victory over the Angels and a stunning sweep of the best-of-five Division Series. After blowing a 6-1 lead in the seventh inning, the Sox flashed their signature resilience to ice their second consecutive trip to the ALCS for the first time since the format began in 1969. The sweep was only their second in 20 postseason series since 1903. The victory allowed the Sox to celebrate clinching their first playoff series at Fenway Park since the 1986 league championship series. But to stage their latest feat, they needed to overcome blowing the largest lead (five runs) by a home team in postseason history. The worm turned on them this time after Bronson Arroyo departed leading, 6-1, with none out and a runner on first in the seventh after a sensational start. On came Mike Myers, who did the Sox no favors by walking the only batter he faced, pinch hitter Jose Molina, to put runners at first and second. Then came Mike Timlin, who promptly retired Curtis Pride for the first out before David Eckstein flared an opposite-field single to right, loading the bases. Timlin responded by throwing three straight strikes past Chone Figgins. Then he got ahead in the count, 0-and-2, against Darin Erstad before he ultimately lost a seven-pitch showdown to force in a run, making it 6-2. Still, the champagne chilled. But after Timlin fired a 91-mile-per-hour fastball for a strike on his first pitch to Vladimir Guerrero, he tried to improve his position by coming back with a 92-m.p.h. heater over the heart of the plate. Bad choice. Guerrero got a bead on it and blasted it into the Sox pen for the tying slam. The devastating shot spoiled a memorable outing by Arroyo, who had surrendered only two runs on three hits and a pair of walks until he handed off to the pen. Johnny Damon and Ortiz helped them wash away the sour aftertaste in the 10th. After Damon singled leading off, he was erased at second on Mark Bellhorn’s aborted sacrifice. Then Ortiz worked his magic, knocking in Pokey Reese, who ran for Bellhorn.